Ed Thornton draws on the Library’s original publications by René Descartes (1596–1650) to discover what the French polymath’s adage “I think therefore I am” can tell us about what it means to be a thinking thing in a physical world. 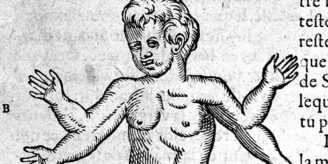 Ed will be exploring Descartes’ work in a talk called Mind and Bodies on Thursday 23 July. Online booking is now open for this free event. Is there any doubt that Rene Descartes was the 17th century’s greatest polymath? It’s true that he was a scientific and medical genius, completing pioneering research into both optics and the workings of the nervous system. It’s also true that his mathematical work in algebra and geometry laid the foundations for much of the modern discipline, including Newton’s calculus. His credentials as a theologian can hardly be questioned either, and even today students around the world are grappling with his arguments for the existence of God. All this, and I haven’t even mentioned the fact that he is the father of modern rationalism and one of the most influential philosophers who ever lived. Just think, it was Descartes that wrote probably the most famous sentence in the history of philosophy: “I think therefore I am”. 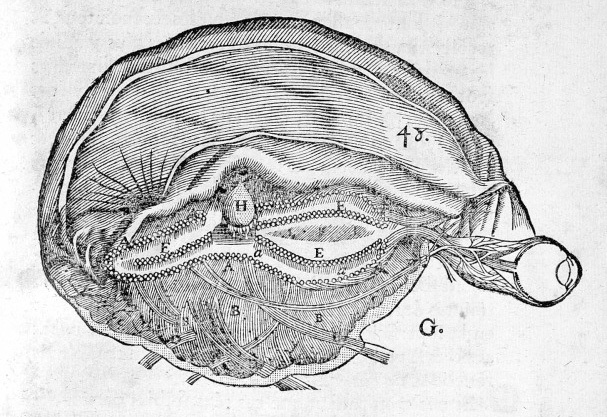 Brain showing optical nerve line drawing from L’homme … et un traitté de la formation du foetus by Rene Descartes. 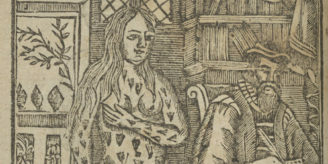 Published 1664. Wellcome Library reference: 14321586. Despite all this, there is still some margin for doubt. Perhaps Descartes isn’t the greatest polymath because there is another undiscovered thinker who was even more brilliant, but whose work was never published? Or perhaps Descartes never existed at all and all of his books were actually written by someone else? The reason I mention these slightly bizarre and ridiculous possibilities is that Descartes’ own method of doing philosophy was based on just this kind of doubting. Descartes wanted to be absolutely certain that his beliefs were correct and so he decided that the best thing to do was to doubt anything that could conceivably be doubted. He found out quite quickly that almost all of his beliefs included some margin for error. He even went so far as to doubt the existence of the material world on the basis that everything around him could be an illusion created by an evil demon that was out to fool him. The reason that Descartes’ simple one-liner “I think therefore I am” was so important, was that it was the only thing that Descartes could find that he was incapable of doubting. No matter how uncertain he was of everything around him, he couldn’t doubt the fact that he existed. Even if all of his beliefs were wrong, he knew that he must exist as the very being that held those incorrect beliefs. The absolute confidence that Descartes put in this statement has subsequently become the paradigm of certainty that philosophers and scientists have tried to live up to ever since. Descartes radical method of doing philosophy, in which he doubted everything, was controversial at the time he practiced it and is remains contested today. One of the most common arguments against him concerns the relationship between the body and the mind. If Descartes is correct, and if it is possible for us to doubt the existence of our bodies, but impossible to doubt the existence of our minds, then our bodies and minds must be different things altogether. But then how are they connected, and how do they interact? The best place to read more about this topic online is probably the page on Descartes in the Stanford Encyclopedia of Philosophy. The Wellcome Library has a lot on Descartes including some original copies of his work published during his own lifetime. Author: Ed Thornton is a researcher and writer currently working on his PhD in the Philosophy department at Royal Holloway, University of London.